A new realization cane to mind recently; when I was a child loving in South Carolina and Texas I always wanted to live somewhere it snowed and I wanted a horse. I hope you can see this, it was pretty in person. Driving hone from work yesterday, I looked up at the stars I used to wish on miles away and years ago. I live in Alaska now, and although I don’t own a horse I get to work with then frequently and I will for two months this summer at Camp LiWa (campliwa.org to learn more and volunteer). With this in mind I realized, I am content. Although, yes there are this I could improve, I am happy with what I have. Things could be better, but they could also be worse and that keeps me going. What I have makes be smile. I guess my wishes have come true. Next Post Sorry, Snow. This isn’t working out. We need to break up. I love looking up at the stars and just simply smiling…you have this moment where when you look up, your life is looked back on and you continue to wish for things you’ve always wanted, but at the same time being thankful for everything in front of you. Its a shame I can’t see the star in the image, though I can imagine it 🙂 It was probably beautiful and a memorable feeling 🙂 Btw I want a horse..though thats probably never going to happen!  The star was just above the two trees, but my phone camera isn’t the greatest for that sort of photo taking.